Royal Air Force Short Stirlings of 15 Squadron Conversion Flight, 1651 Conversion Unit, in flight. Note the faint squadron code "LS." The Short Stirling was the first four-engined heavy bomber in RAF service, entering combat operations in February 1941. A late addition to Air Ministry Specification B.12/36 required a wingspan of 100 feet, to keep weight down and ensure compatibility with existing hangars. This imposed a low service ceiling of 20,000 feet (6096 meters). As a result, the Stirling was attacked by German fighters more frequently. 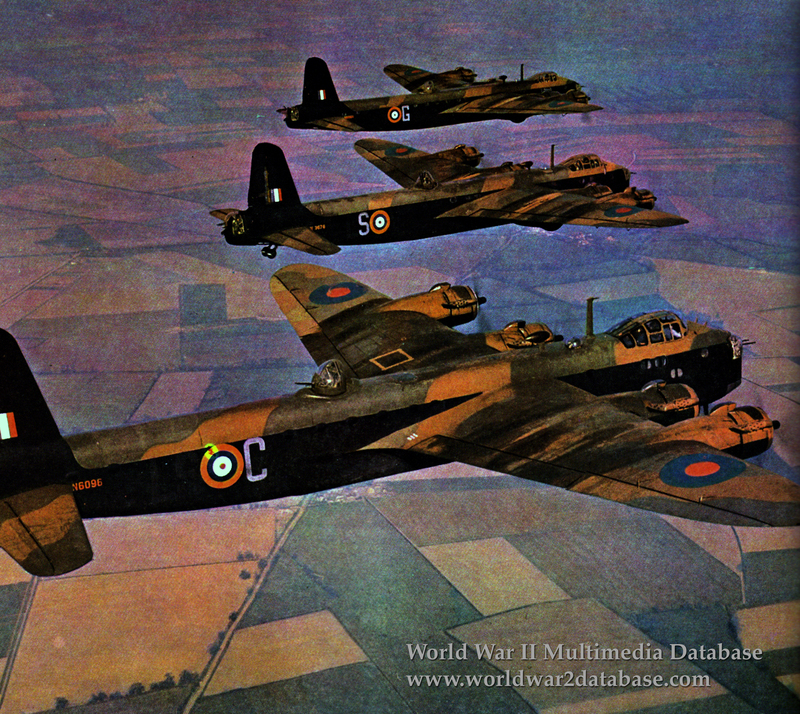 A further limitation was the segmented bomb bay, which prevented it from carrying the 4,000-pound (1814-kilogram) "cookie" bombs that were preferred by RAF Bomber Command for area bombing of Germany. The type was pulled from front-line combat operations in December 1943 as more Avro Lancasters and Handley Page Halifaxes became available. Stirlings, larger then either of those aircraft (the cockpit was 23 feet (7 meters) off the ground) was used deployed mines and pulled gliders. These 15 Squadron aircraft are part of training unit that prepared RAF crews to fly the Stirling. The squadron operated Stirlings until December 1943.